Charter Oak at Winvian Farm is a barn-and-silo-like cottage built around an oak tree, with a Jacuzzi and fireplace. There’s something romantic about the idea of camping — breathing in that crisp air all day, the smoky scent of the campfire at night, and falling asleep under the stars. Then reality sets in. There’s something sharp under your sleeping bag. This ground is hurting your back, you can’t sleep, the food and beer are getting warm in tepid cooler water. What you wouldn’t give for a hot shower and a good cup of coffee. Have no fear, weary traveler. Go glamping. 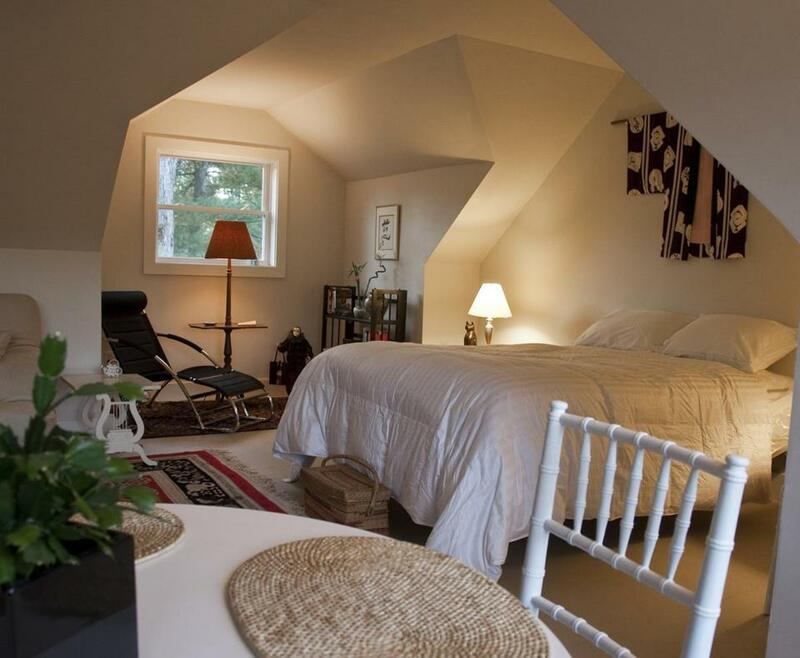 Glamping, a portmanteau of glamour camping, has been gaining in popularity in recent years, and now there are some gorgeous glamping spots in New England, places you can sleep amid trees, read by a crackling fire, and wake to birdsong — but where you can also sleep in a real bed, take a hot shower, and wake to good coffee. At Moose Meadow Lodge & Treehouse in Waterbury, Vt., you can stay in a handcrafted two-story treehouse made of cedar, pine, maple, and hemlock, built on two mature pine trees. Its 31 windows let in enough sun and moonlight to make you feel like you’re under the sky, and offer views of the pond at Moose Meadow. A small living and dining area with handcrafted furniture allows a cozy place to sit and eat. A freestanding electric heater stove gives the ambience of a campfire — minus the work. Climb the circular staircase, which hugs a maple tree, to the bedroom loft where a handcrafted antler chandelier hangs from a high ceiling built with live-edge hemlock beams. Snuggle into the custom-made queen-size bed with its fresh linens, wake with the sun, and walk out to the balcony for a sweeping view of pond, woods, and meadow. Take a hot shower in the outdoor bathroom, which offers robes, soaps, and a hand-carved sink made from a boulder found on the property. Wake to hot coffee and sip it outside on the wraparound deck, watching the sun rise on the pond. Spend the morning hiking — there are 86 acres of private trails — and make your way up to the highest point on the property, a gazebo with stunning views of the Green Mountains. Pack a picnic. In the afternoon, fish for rainbow trout — the pond is stocked — and grill your dinner on the outdoor grill. And you won’t need that cooler. Guests have use of the kitchen in the main lodge, including fridge and stove. 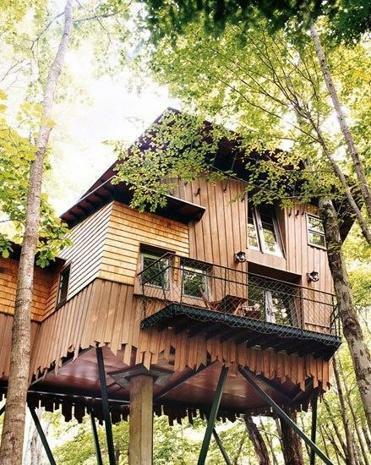 Bring your own wine; the treehouse comes stocked with wine glasses. At night, toast your s’mores over the fire pit. And feel free to Instagram; there’s free Wi-Fi on the property and outlets in the treehouse to charge your phone. 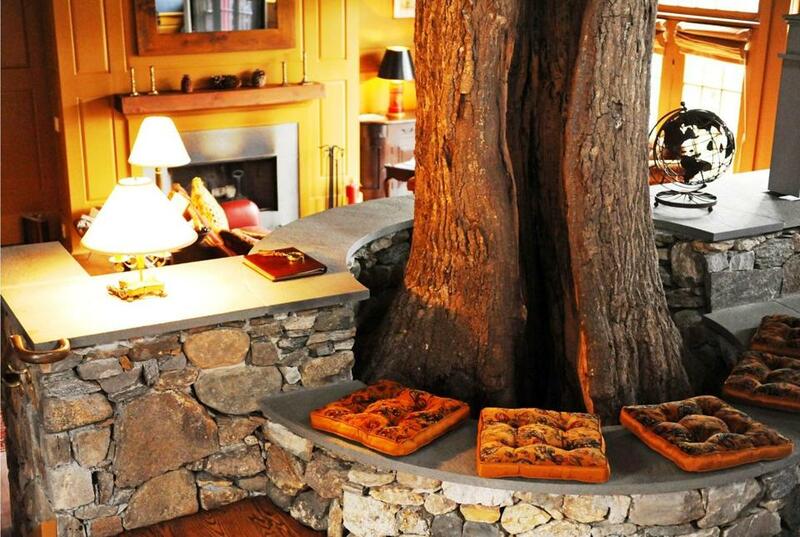 607 Crossett Hill, Waterbury, Vt. 802-244-5378, moosemeadowlodge.com. Winvian Farm in Morris, Conn., puts the “glam” in glamping. Glampers have their choice of 18 aptly-named themed cottages, such as Greenhouse, Stable, Log Cabin, Music, or Treehouse. Treehouse, for example, a glam take on your old childhood camp, is suspended 35 feet above the forest floor and boasts a first-floor bedroom with king-size bed, gas fireplace, steam shower, and Jacuzzi. The second-floor lounge offers a wood-burning fireplace, queen-size sleeper sofa, and full bar. Treehouse is one of the cottages at Winvian Farm. Bookworms, find your paradise in the Library cottage, with its skylights, brass reading lamps, and wood-burning stone fireplace. Climb the ladder to a book-lined wraparound mezzanine. Read one more chapter before you sleep in the king-size bed and wake to read the next chapter, mug of coffee in hand, on the screened-in porch. And Beaver Lodge looks like a Hobbit hole come to life, all warm wood and soft stone by the shores of Beaver Pond. Trees are everywhere, including by the bed posts and in the bathroom, which boasts a river rock floor and Jacuzzi. A spiral staircase winds around a tree trunk to the loft, and the stone fireplace is out of a fairy tale. One of the units at Maine Forest Yurts in Durham has bunks enough for a family. If you’re looking unplug, unwind, and get back to basics, Maine Forest Yurts, a 100-acre swath of wilderness by Runaround Pond, offers more camp vibes than glamp vibes. A traditional yurt is a circular tent, sometimes made of felt or skins, on a collapsible latticework frame; they were used by nomads in Mongolia, Siberia, and Turkey. Modern yurts are often built on a wood platform and might be made of wood, metal, canvas, plexiglass, etc. 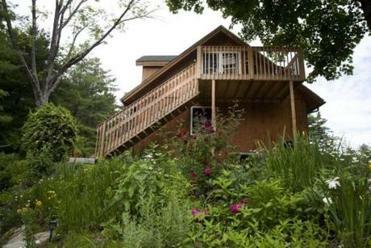 Birders, take sanctuary at TreeHouse near the foothills of the Berkshire Mountains in Sharon, Conn. While it has the look and feel of a treehouse from the outside, inside is a furnished studio apartment with full kitchen, queen-size bed, sofa bed, full bathroom with towels and hairdryer, and a stock of books, games, and free Wi-Fi. Lauren Daley can be reached at ldaley33@gmail.com.